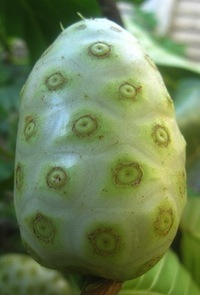 Hawaiian OLA Noni Energy Shot is a noni Juice based shot made in Hawaii, USA. This all natural shot is 75% juice and is marketed as a high antioxidant energy shot alternative to the many artificial shots on the market. Hawaiian OLA reminded me of those juice/tea hybrids on the market. The tartness of the green tea was balanced with a slightly sweet fruit flavor. The shots I sampled had pieces of something in them, which was surprising. I assume it was the fruit, but I couldn't find mention of this on the bottle. The bottle states to shake the product well and I did so, but still noticed the texture. The newest version of Noni Energy Shot is smooth with no texture. Much more enjoyable to drink. I really like natural shots and OLA has noni, goji, acai, lilikoi, yerba mate', and green tea with some other organic juices, while being sweetened with organic cane juice. This vegan shot is certified gluten and GMO free and all ingredients are from sustainable, fair market sources. A nice dose of B vitamins is thrown in for good measure. 140mg 150mg of natural caffeine gave me a nice lift to get me through the afternoon and beyond. I continue to believe that the lift from green tea is a better quality lift than coffee because of L-theanine. Overall, Hawaiian OLA Energy Shot is good product although I would like some clarification on the smoothness aspect of the drink. The recent reformulation produced an even better product for those looking for an all natural and healthier lift. For those that love the idea of all the antioxidants, but don't want the caffeine, Hawaiian OLA now makes a Noni Immunity shot. It tastes similar to the original minus the green tea flavor. This shot adds less B vitamins, more vitamin C and throws in some zinc. Overall, a nice all-natural shot for those that do not consume caffeine. Organic Hawaiian Noni Juice, Organic Fair Trade Certied Mango Juice, Organic Pear Juice, Organic Apple Juice, Reverse Osmosis Water, Organic Fair Trade Certied Evaporated Cane Juice, Organic Lilikoi Juice, Organic Goji Juice, Organic Acai Juice, Organic Pineapple Juice, Organic Pineapple Flavor. Sugar content: 12 grams (per 2.5 ounces). How Does Hawaiian OLA Noni Energy Shot Compare? Hawaiian OLA Noni Energy Shot contains 60.00 mgs of caffeine per fluid ounce (202.88mg/100 ml).